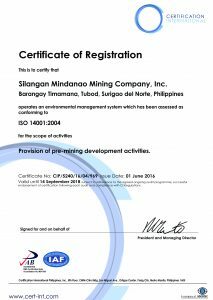 The Silangan Project, located in Surigao del Norte, consists of two deposits – Boyongan and Bayugo. The Project is registered with the Board of Investments (BOI) as a non-pioneer project entitled to four years of income tax holiday beginning 2017, extendable for another two years subject to certain conditions. In October 2016, the Project filed a request with the BOI on the movement of the start of the income tax holiday to the beginning of 2021. This request is currently pending with the BOI. In November 2010, as part of the Project’s pre-feasibility study, SRK Consulting – an independent leading international mining engineering consulting firm – was engaged by SMMCI to make an independent evaluation of the project. SRK recommended the construction of an exploration decline or ramp to the bottom of the Boyongan deposit as part of a geotechnical investigation to provide more reliable and specific information on the area’s ground condition for purposes of mine planning and design as well as to obtain bulk samples from the ore body. The development of the decline started in April 2011 and advanced until January 2015, reaching a distance of 1,415m from the portal, with dimensions of 5m-high and 5m-wide. The center of the Boyongan deposit’s eastern high grade zone was mapped and bulk sampled via a crosscut, called the Ore Characterization Drive (OCD), approximately 800 meters from the decline. Another bulk sampling program was conducted from the surface using large diameter bore holes from May to December 2014. The decline, together with the OCD, was decommissioned last November 2015 and its portal was closed before the end of 2015. Under the supervision of lead consultant AECOM, a total of 100+ tons of bulk ore samples were prepared and shipped to various laboratories in Australia for bench and pilot metallurgical tests. This would be used for the development of the pilot plant. Meanwhile, the process flow design of the pilot plant, which produced copper cathodes, would be a significant input to the Definitive Feasibility Study (DFS). Value-engineering studies on the project was undertaken by AUSENCO, an independent engineering firm based in Brisbane, Australia in early 2016. The study progressed into a full Definitive Feasibility Study and is expected to be completed in 2017. The project’s amended ECC for the surface mining method was approved in May 2016 following the approval of the amended Mining Project Feasibility Study in connection with the approved Declaration of Mining Project Feasibility. The total expenditure related to the project as of December 31, 2016 amounted to P16.840 billion, including the P1.438 billion incurred prior to 2009, when the project was under Anglo. The figure does not include the fair value adjustment amounting to P5.552 billion. In May 2011, the Company executed a Farm-In Agreement with Manila Mining Corporation (MMC), which involved the purchase of a 5% equity interest in Kalayaan Gold-Copper Resources Inc. (KGCRI), a subsidiary of MMC that assigns the right to explore the Kalayaan properties covering 286 hectares under EP-XIII-014B. This area is adjacent to EP-XIII-013 and forms part of the overall Bayugo deposit. Under the agreement, the Company was to conduct exploration activities in the property for three (3) years but was extended for an additional three years. Exploration of the area is currently on hold pending the approval of the Third Renewal of the Exploration Period. 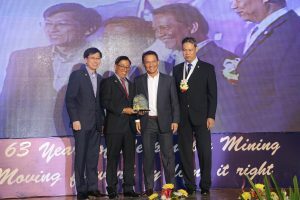 In the event the Company declares commercial feasibility of the area within the period, it will have the right to increase its holdings in KGCRI to 60% by subscribing to an additional 55% of KGCRI’s outstanding capital stock for a minimal amount and will become an integral part of the Silangan Project. The Company commenced drilling in December 2011 after ground preparations, environmental mitigating measures and community-relations initiatives had been conducted. This transpired for about seven (7) months after the signing of the Farm-In Agreement. By September 2013, a total of 73,520 meters had been drilled, of which 66,486 meters were for resource definition and 7,034 meters for scout drilling. In 2014, detailed logging of 57 definition drill holes of East and West Bayugo, totaling 26,104.64 meters, was completed. This activity increased the confidence in the understanding of the mineralization. In addition, magnetotellurics (MT) survey from the surface was conducted, which provided preliminary data on the hydrologic model of the Boyongan and Bayugo deposits. These drilling results will be the basis of the Mineral Resource Estimation (MRE) which is necessary to advance the project to pre-feasibility and feasibility study stages.